Wok-fried pea shoots show us how a brief fling in the wok with a little garlic and sesame oil is all that’s needed to coax delicate pea shoots to tender, aromatic perfection. 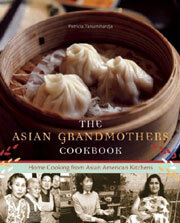 Author Pat Tanumihardja notes in her book that “this cooking method can be used for many vegetables, from bok choy to tatsoi to Chinese flowering cabbage (choy sum). For vegetables with thicker stems or ribs, separate the leaves and stems and add the stems first as they require a longer cooking time.” Okay, then. Sautéed greens all year round it is! 1. Trim the ends of the pea shoots as well as any tough stems. 2. Heat a large wok or skillet over medium heat. Swirl in the oil and heat until it starts to shimmer. Add the garlic and cook until fragrant, 15 to 30 seconds. Increase the heat to high, throw in the pea shoots, and toss to coat evenly with the oil and garlic and keep tossing until the leaves are just barely wilted, 1 to 1 1/2 minutes. 3. Add the stock and soy sauce and toss until the liquid has reduced to a few tablespoons and the shoots are tender and bright green, another 1 to 2 minutes. Drizzle with sesame oil and serve immediately. 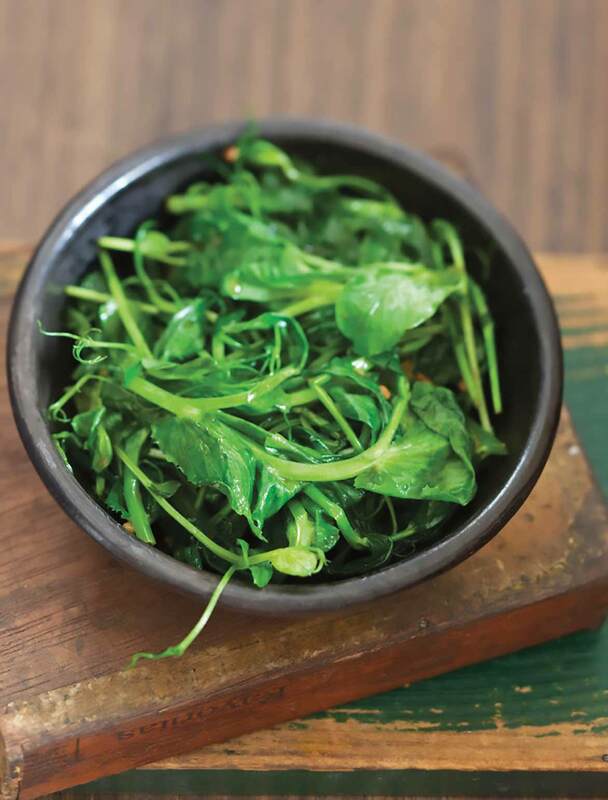 This fried pea shoots recipe was simple and very tasty; an excellent side dish for any Asian meal. I picked up some pea tendrils at my local farmers market and was debating what to do with them. Then I stumbled upon this easy recipe and knew I had to make it. It was tasty and a cinch to make. Coincidentally, a friend had long ago loaned me this very cookbook, which has been collecting dust on my bookshelf, and I’m now looking forward to sitting down and going through it. Wok-Fried Pea Shoots Recipe © 2009 Patricia Tanumihardja. Photo © 2009 Lara Ferroni. All rights reserved. All recipes and photos used with permission of the publisher. Maybe I’m just antsy for spring, but when I saw pea shoots at an upscale Italian market this afternoon (nope! neither a farmers nor an Asian market! ), my heart sang! Feels like springtime in January! Pro tip: I’m serving to non-chicken and non-fish eaters so it’s water and soy sauce for us, though I might sub out the water for a vegetable stock. Though it’s suggested to serve with a meat dish and steamed rice, I think the bright cheerful green of the shoots would be excellent with the Glazed Tofu and steamed rice. Marvelous, Elsa! And you never know where you’ll happen upon shoots. (And I suspect I know which upscale Italian market you found these in.) Glad you snatched them up!